It is the summer school holiday and the kids of Sugarbush Valley are enjoying the break. Everyday is spent at a friend’s house or somewhere outdoors. The days are filled with fun and games. Rebecca Periwinkle is only one of the lucky girls to enjoy these fun filled days with her friends. Rebecca lives in Cedar Terrace 2 with her family. Father Alex and Mother Rebecca owns the shoe shop in the village, which is known for the outstanding quality shoes that is sold there. Rebecca also has an older brother Oliver, who she adores. Although not often seen together in the village, they have a tight bond and share a lot of secrets. Rebecca’s favorite thing in the world is shoes, as she grew up surrounded by shoes, it is somewhat understandable, but unlike any other 11 year old 3 pairs of shoes is not enough for Rebecca. She needs a pair that fits every dress in her closet perfectly. It is her dream to become a famous shoe designer one day. So it goes without saying that helping out in her parents shop on Saturday mornings or during school breaks is her favorite past time. Like all 11 year old girls Rebecca has a best friend, who is Nichole Maces. They are inseparable and during school breaks they spend most of their days together. They are often referred to by fellow classmates and the villagers as the awesome-twosome and if not seen together, they always have to explain where their better half is. Except for being best friends they belong to a bigger group of friends that includes all the girls in Sugarbush Valley. Everyone from 8-year old Nellie to 14-year old Candy is part of Rebecca’s group of friends and she can have as much fun with either one. Today is just one of the many special days in Sugarbush Valley. Not only is it school holiday, but it is also the birthday of Annabel Buttercup and all the girls have been invited to the party. Rebecca is very excited about the party and will be wearing her prettiest dress and new ballet pumps. However, the party is not until much later in the afternoon and she has a fun-filled morning planned with Nichole. Both Rebecca and Nichole loves horses, but owning one is not really an option so they love to visit the Blackberry’s market site. This morning, their day starts here. Rebecca: Hi Ingrid, we are here to help you groom Blacksocks! Ingrid: Hello awesome twosome, glad you could make it. I told Blacksocks all about your visit and he is quite excited. He just loves all the attention. Nichole: Well, we love giving him all this attention, he is such a sweet and fabulous horse. Rebecca: So where do we start and what needs to be done? Ingrid: Fist we have to brush his whole body with this brush. After that we comb his main and tail. He likes it when his body and main are attended to, but can get quite agitated when someone is fiddling to much with his tail. I was thinking that I will handle the hind-legs and tail and then you two can decide who does the body brushing and main combing? Nichole: I would prefer to brush his main as I'm sure the short body hair will make me sneeze, is that ok with you Becs? Rebecca: Oooh of course, I would love to brush his body. The girls worked really hard for an hour and afterwards Blacksocks got rewarded with water and carrots for his good behaviour. Mother Betty rewarded the girls with fresh smoothies and her famous carrot cupcakes. Rebecca: Thanks Mrs Blackberry for the lovely refreshments. We must be off. We still have lots to do before Annabell's party. We will see you there Ingrid? Ingrid: Oh yes off course, I'm not missing that. I've heard rumours of an ice cream party. Rebecca: That should be fun. Bye then, see you later Ingrid. 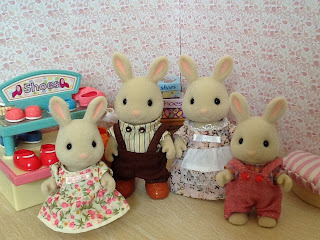 The girls made there way to the Maces cottage, which was situated on top of their shop, the Sylvanian Market. As they reached the top of the stairs Mother Arvey was already waiting for them. Mother Arvey: There you are, I was just beginning to worry that you have forgotten. Nichole: Never mommy, I know that you have to go out for some groceries, and I did promise. Rebecca: Morning Auntie Arvey (Mother Arvey insisted that Rebecca calls her Auntie, as she feels it is just to formal that her daughter's best friend addresses her as Mrs). If you don't mind I've offered to help Nichole babysit. Mother Arvey: Oh no not at all, that is kind of you. Ok girls I'm off. I've left snacks and cake for you on the table. JC will also want a snack soon, there is some yogurt for him. I'll be about an hour. Nichole: We will be fine, mommy. And remember the milk. Mother Arvey left and the girls were alone with little JC. Rebecca adored the little boy and always loved spending time with him. She wouldn't mind a baby brother or sister herself. They entertained JC for quite a while first by playing with his educational learning house and then reading him a story. They began too feel peckish and went upstairs to have a snack. Rebecca was astonished by the amount of snacks for just the two of them, but she knew that Auntie Arvey likes treating them. In what felt like a minute, Mother Arvey was back from her grocery shopping. Mother Arvey: Hey girls, everything ok? Nichole: Sure mommy and you know that JC is a little angel. Rebecca: Oh and thanks for all that lovely snacks, Auntie Arvey. Mother Arvey: Glad you liked it Rebecca, and that all went well. I think for you hard work you deserve a little something, here are 5 Kaolin (Sugarbush Valley money) each. Rebecca: Oh that is too generous and not at all necessary, but thank you so much Anutie Arvey, now I can buy a gift for Annabell. Nichole: Oh that is a great idea, if we put it together we can buy her something bigger. Lets go and see what my dad have in the toy department. Rebecca: Great thinking Nix. Lets go. Nichole: See you later mommy, bye my adorable little brother. Rebecca: Bye Auntie Arvey and thanks again. The awesome twosome rushed downstairs to the toy department. They had a hard time deciding on something, but eventually settled on a small squirrel doll. Nichole: Hi daddy, we want to buy this doll for Annabell's birthday. Father Spencer: That is generous of you, but you know that you don't have to buy it, I'll give it to you. Rebecca: Oh no Uncle Spencer we want to buy it, we earned the money by looking after baby JC and would like to spend it well. Father Spencer: Ok, so who am I to disagree with that. Father Spencer(did secretly give them some discount on the doll. He was real proud of these two): there you go girls. Enjoy the party and hope Annabell likes her gift. Just as they were about to leave Mother Arvey came in through the door. Mother Arvey: Oh good you are still here, Nichole I forgot to pick up our weekly doughnut order, will you stop by Pippa's Delicatessen and get it for me. Nichole: Sure mommy, but first we are off to the Periwinkle's shoe shop. Rebecca has to help in the shop for a while and I'm going with. Is it ok if I deliver it before I go to the party. Mother Arvey: Yes that is fine, thanks dear. The girls left the Market and made their way to the Periwinkle shoe shop. Rebecca loved working there and often would beg her parents to let her help them. Today they will assist her father with sales as her mother had to take Oliver to the dentist in Blueberry Hill. Rebecca: Hi daddy, we are here to help you. Father Alex: Hi Sweetpea and Nichole, I'm so glad you are here. We have been busy this morning and I have to finish a pair of shoes and look at the books. I'll be in the back. Call me if you need help. Rebecca: Ok we will be fine. Father Alex disappeared through the back office door. The girls first took a good look at all the fabulous shoes in the store. Then Rebecca suggested that they try some of it on. Nichole: I would love that, but are you sure we may? Rebecca: As long as we are careful, it is not a problem and you are a paying customer, aren't you? Nichole put on the shoes and posed with it, she loved the shoes and it looked great with her dress. Rebecca also tried it on. Rebecca: So what do you think? It is lovely? Nichole: Ooh I love them, I'm telling mommy I want them for my birthday. As they were about to put away the pair of shoes, Mother Delia and Karen came into the shop. Rebecca: Morning Mrs Chiffon. How are you this morning. Mother Delia: Hi Rebecca and Nichole, we are fine. How are you? Is your mom or dad here, I'm looking for a pair of new shoes for Karen? Rebecca: I'm just fine. My mom took Oliver to the dentist in Blueberry Hill and my dad is busy doing the books in the back office, but if you don't mind I can show you what we have on offer. I think I have just the perfect pair of shoes for Karen. Mother Delia: That is no problem, show us the shoes that you have in mind, but we will have a look what else is in stock too. Rebecca: It is this pair of red shoes, it will fit perfectly with her dress. Karen: Ooh I do love them, can I try it on mommy? Mother Delia agreed that is just the pair of shoes they were looking for and Karen confirmed that they fit perfectly. Rebecca also convinced Mother Delia to try on a pair of bright orange shoes, which was a perfect fit too. Mother Delia: I will take the pair of orange shoes too, Rebecca. You sure are a great sales lady. Rebecca: Thank you Mrs Chiffon, I love working in my parents shop. Mother Delia: Take care and I guess we will see you at the party this afternoon? Rebecca: Yes we will be there, and Karen wear you new shoes, they look fantastic. Karen: Thanks Rebecca, I love them. See you later. Just as the Chiffons disappeared through the shop door, Father Alex came in from the back. Father Alex: So I am done with the books, thanks for managing the shop you two. Rebecca: It is a pleasure daddy, you know I love working here. We managed to sell two pair of shoes. Father Alex: Two pairs! Wow that is a job well done. Thank you so much. Nichole: It was all Rebecca Uncle Alex, you should have seen her. Mrs Chiffon didn't know how to say no. Father Alex (laughing): Delia is usually a soft target and one of my best customers. Thanks again girls. Rebecca: Daddy we are leaving now, we must go and get ready for the party. Alex: Yes that is fine. Oh and Rebecca remember to pick up the flowers for the shop on your way home. Enjoy it. Bye! The girls left the shop. Nichole: I think I must quickly go and pick up the doughnuts for mommy, before I go home. Rebecca: I will walk with you. Then on our way home we can stop at the florist. Nichole: Great idea. Well here we are. Mother Savannah and Nellie Trunk was just placing an order when the girls arrive. Rebecca: Hi Mrs Henry-Lloyd. Hi Mrs Trunk. Great to see you Nellie and Sarah. All together: Hello awesome twosome. They had a quick chat before the Trunks left. Nellie: Bye everyone, see you at the party. Mother Pippa: Nichole, have you come to collect your mother's doughnut order? Mother Pippa: I saw her rushing past earlier, but before I could stop her she was gone. She can really move very fast if she wants to? Sarah: So are you and Nichole also attending Annabell's party this afternoon? Rebecca: Yes, I will not miss it for the world. Sarah: I hear it is going to be an ice cream party? Rebecca: I've heard that too, it is going to be delicious. Sarah: I really hope Annabell didn't invite the boys, they will just make a mess of everything. Rebecca (giggling): I think you have a point, we will see. Nichole collected the doughnuts, the girls said their goodbyes and off they went. Next stop was the Florist, but as they went passed the laundromat they noticed that the Mulberries are hard at work. They stopped to have a quick chat with Candy. Rebecca: Hi Candy. What are you guys doing? Candy: Hi Rebecca and Nichole. Ike and me are helping our parents to get the shop renovated. My mom was getting tired of her old wallpaper. Nichole: Ooh I love the new wallpaper it sure does look fresh and clean. Candy: I like it too. Rebecca: I guess we will see you at the party? Candy: Of course I'm not missing that, I hope that adorable Cheddar is there! At the Florist Mrs Fisher and her daughter was just saying there goodbyes. The Fishers are the newest family in the village and already very popular. Lauren is very good in sports and also very competitive. Rebecca: Oh hi Amelia and Lauren. Amelia and Lauren: Hi awesome twosome! Nichole: Lauren are you looking forward to the start of the term. Lauren: Yes very much, I'm just glad I met most of the girls already, so that it is not totally new. Rebecca: We should try to play another game of tennis soon. I think the trails for the first team will be on the first day. We usually face one of the schools in Blueberry Hill the first weekend after the start of term. Lauren: We should, I really enjoyed playing against you Rebecca. You are really good, I only managed to just beat you. Rebecca: I'm lucky to have Oliver as my practice partner, he is really really good and wants to win Wimbledon one day. Lauren: Maybe we must arrange a double's match too. Linus is not too bad either. Rebecca: That sounds like fun. We have to go and get ready for the party. See you there? Amelia: Yes definitely. Lauren will be coming with me. Mother Isabel and Lauren left and Rebecca quickly went into the store to get some flowers for the shoe shop. Leaving Amelia and Nichole to chat some more. Mother Katrina: Hi Rebecca., I guess you are collecting the monthly flowers for the shoe shop. Rebecca: Yes please Mrs Whiskers. My mother was really impressed with how long the other bunch of flowers lasted. Mother Katrina: Well only the best for my clients. Why don't you try a potted plant, as you can see all is in bloom? Rebecca: I think that is the great idea, I love the pansies. Mother Katrina: Good choice. The only started blooming yesterday. Rebecca: My mother will love them. Thank you Mrs Whiskers. Finally the awesome twosome was finished with their chores for the day. They said their goodbyes at the corner of the street and went there separate ways. They will meet up later to go to Annabell's birthday party together. Thx JC! I loved doing this one, but it took a while. I love the loft bed too! It is one of my favorite furniture pieces. I just wish I had "real" SF buildings for all my shops. Thx Sigrun, when I did this one it was my favorite story to do. The b-party is on the background for now, after my early christmas parcel. Early Christmas, receiving some parcels!